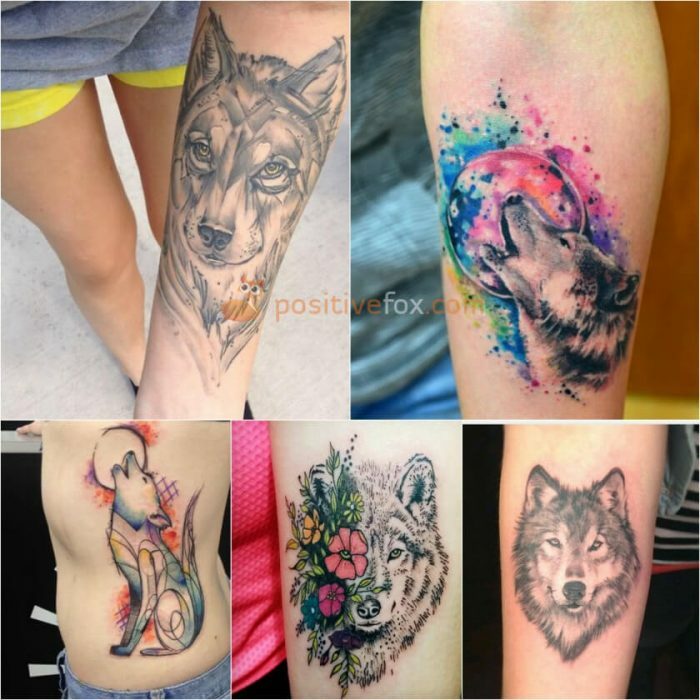 Wolf tattoos are chosen by exceptionally strong individuals, who are always prepared to defend their beliefs. 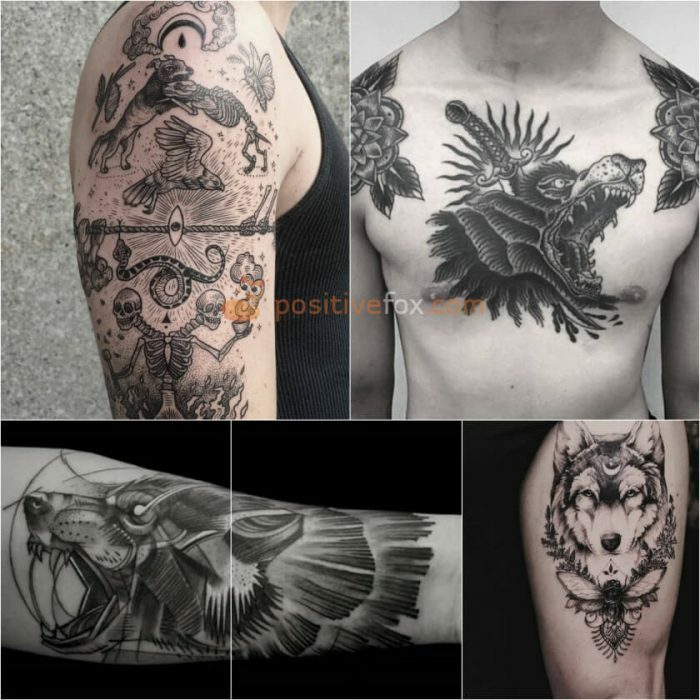 A wolf tattoo will become a talisman that will support and protect its “owner” in difficult times. 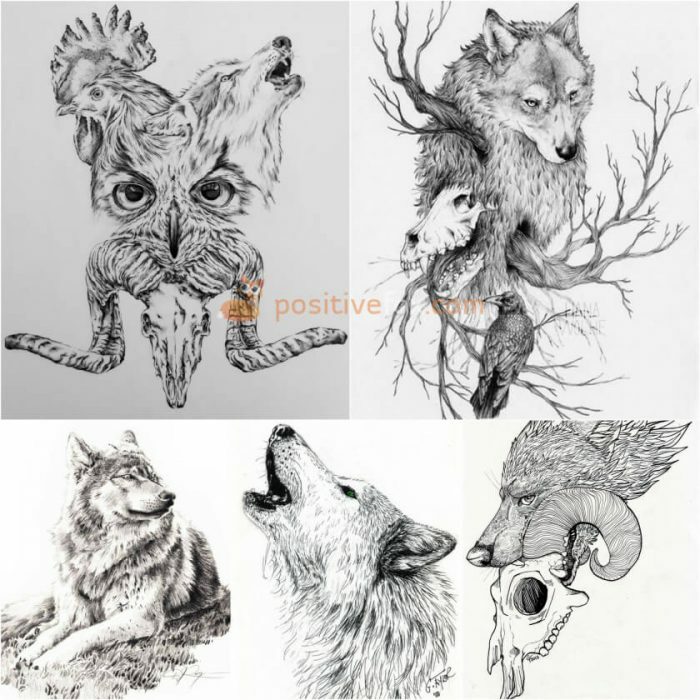 Wolves are noble and magnificent beasts, which have a lot of mythological symbolism, mystery and stories associated with them. 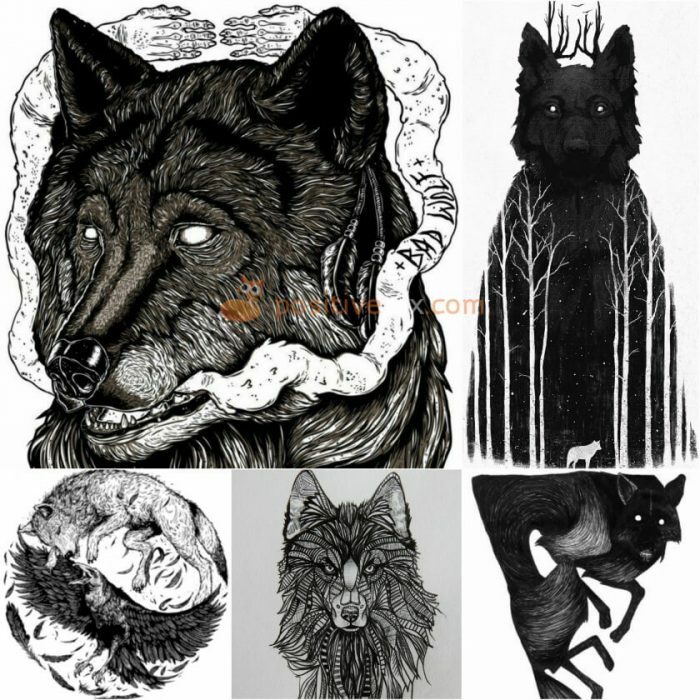 Wolves have a distinct, dual nature: they can be independent yet faithful, calm yet aggressive. 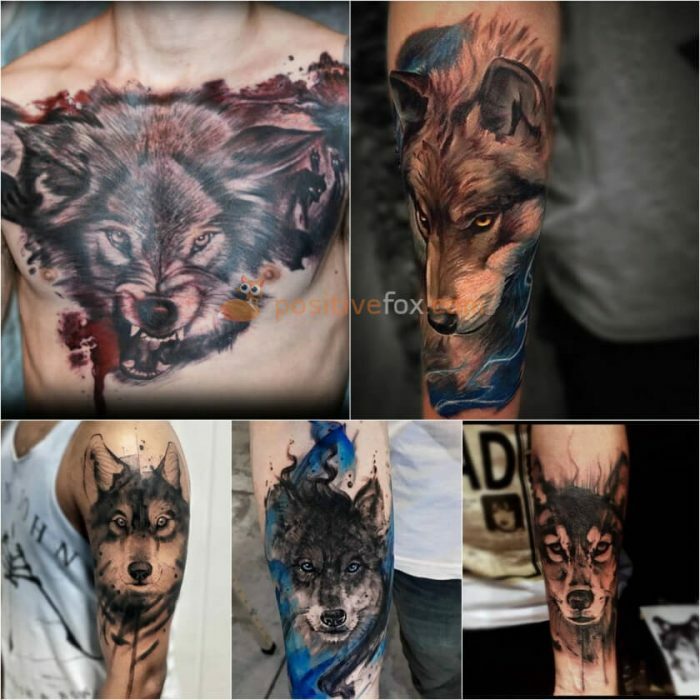 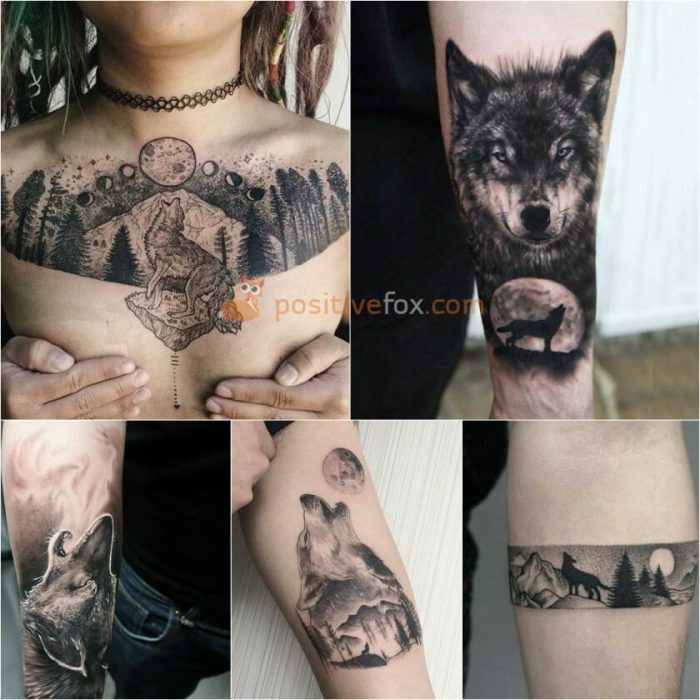 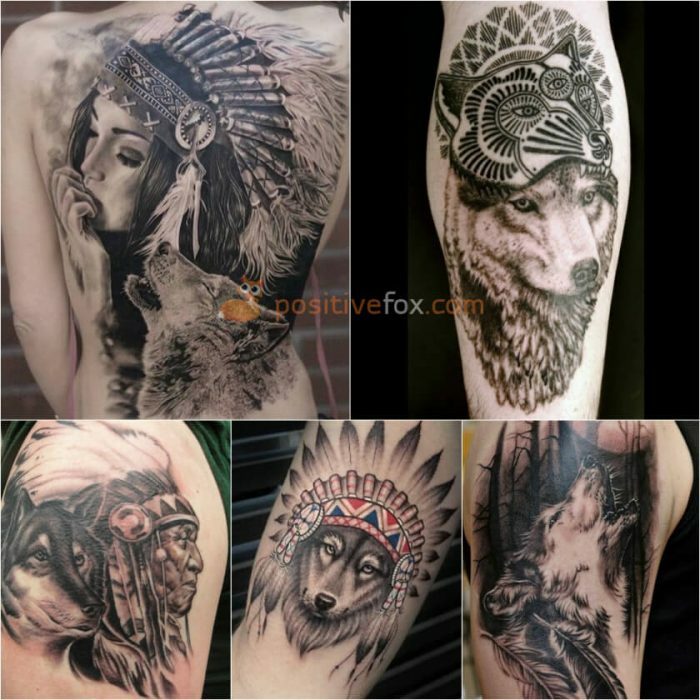 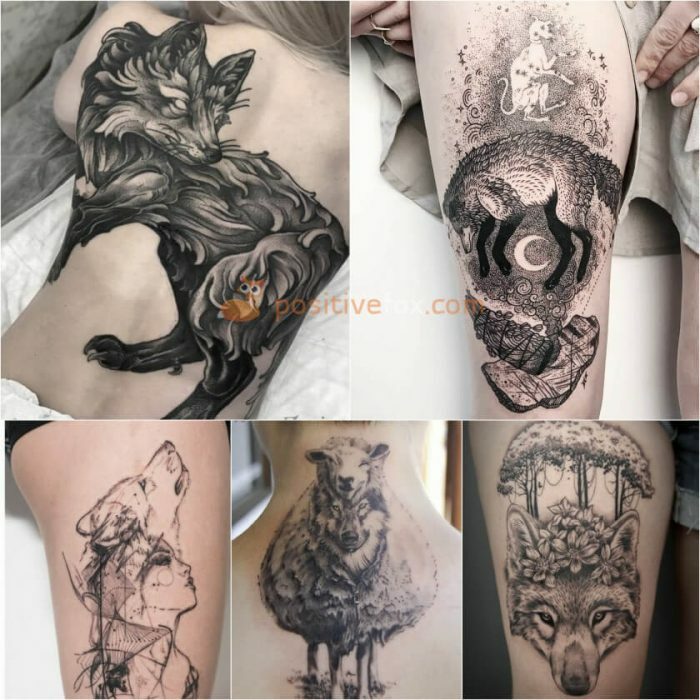 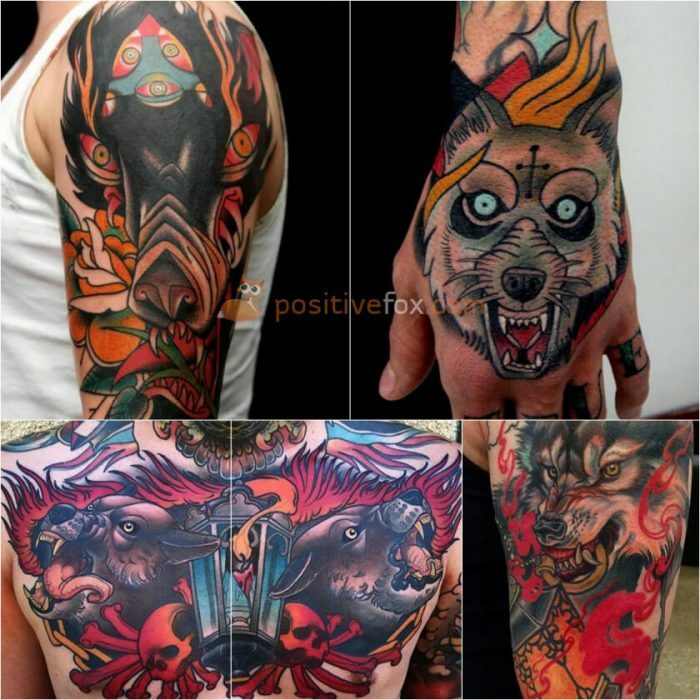 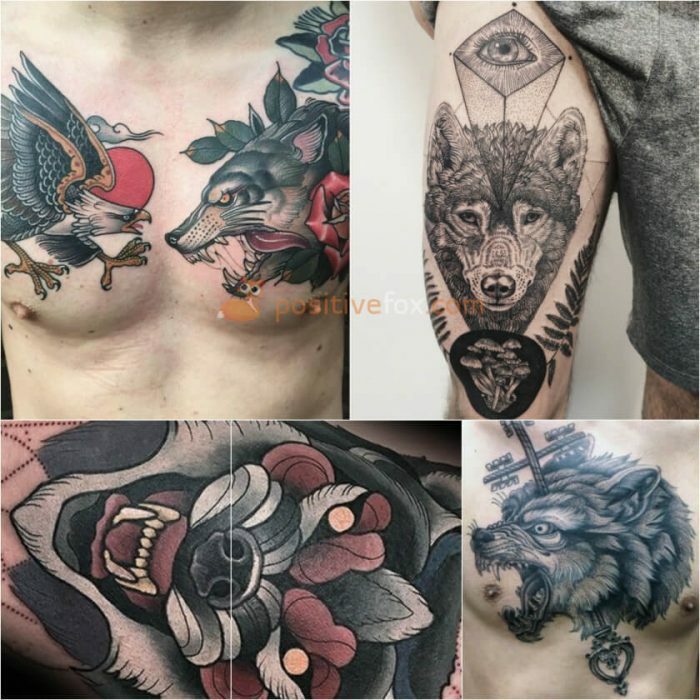 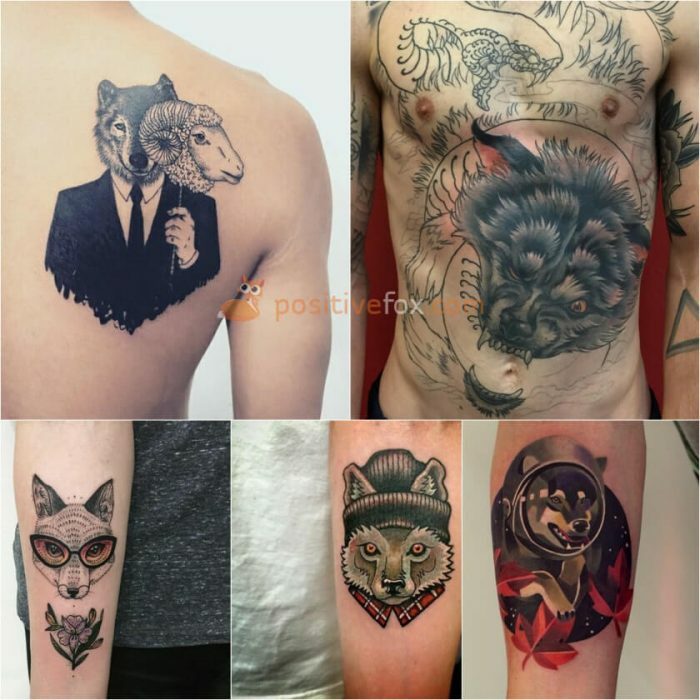 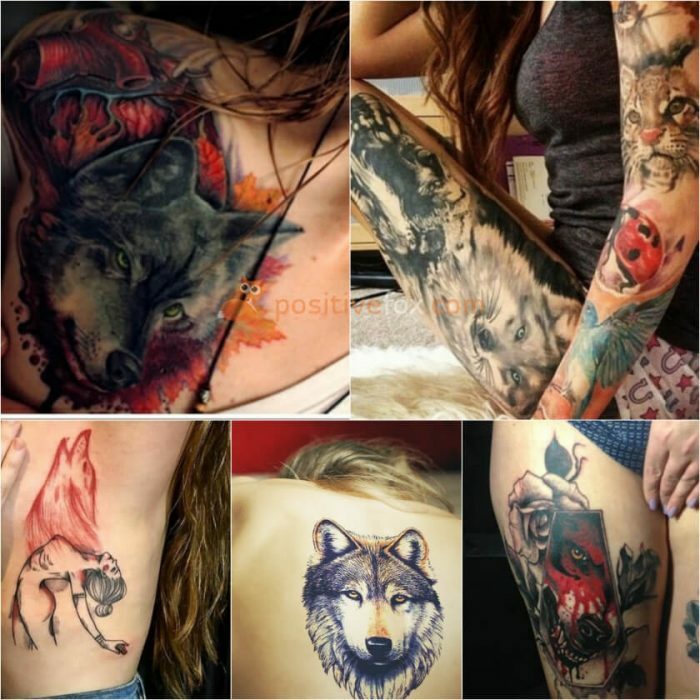 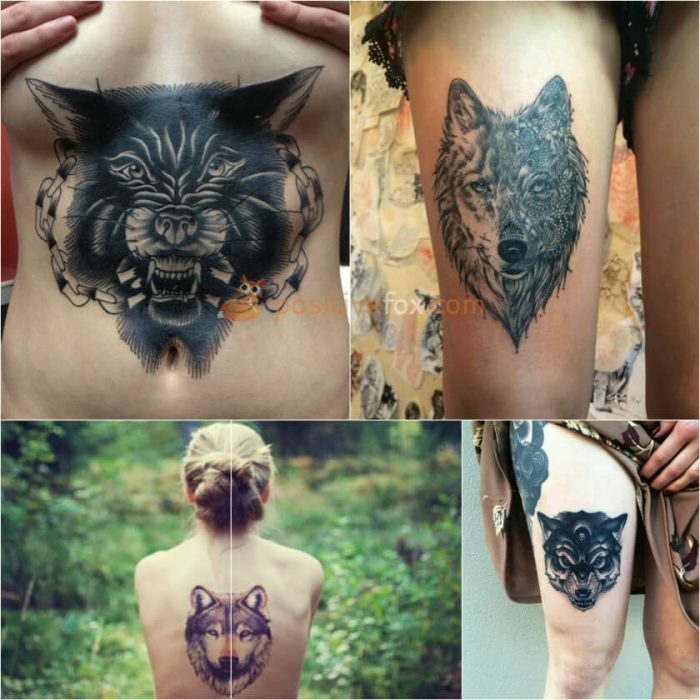 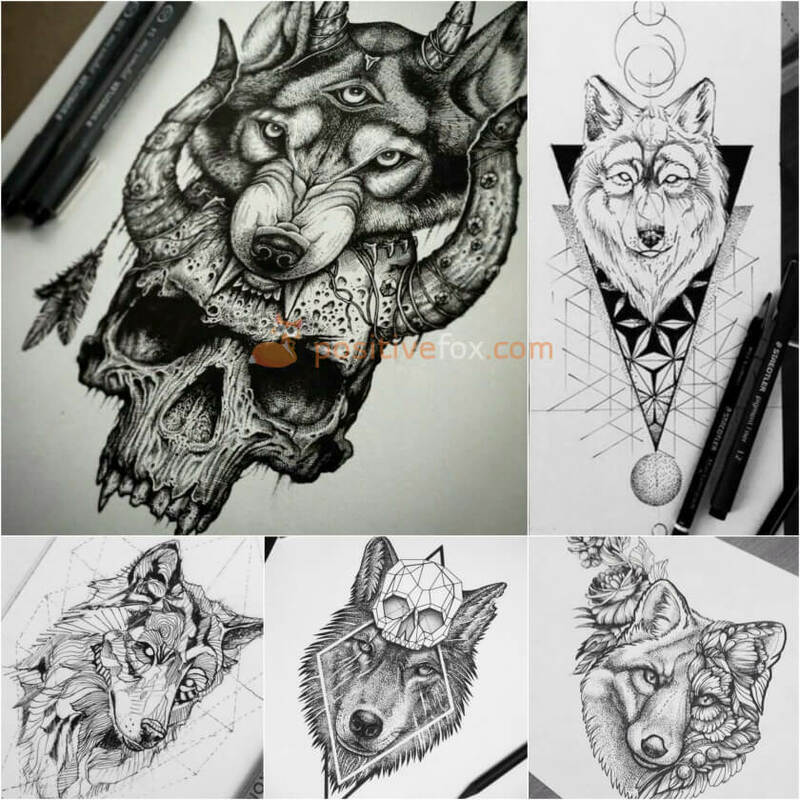 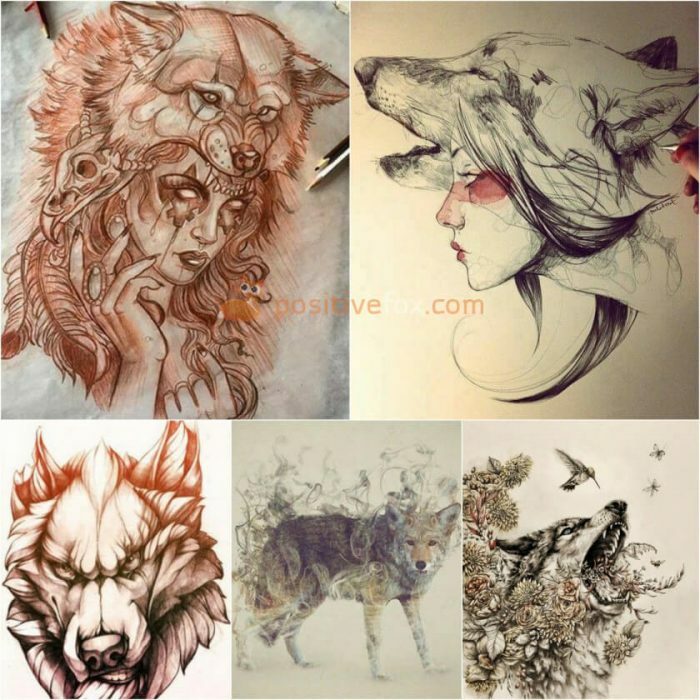 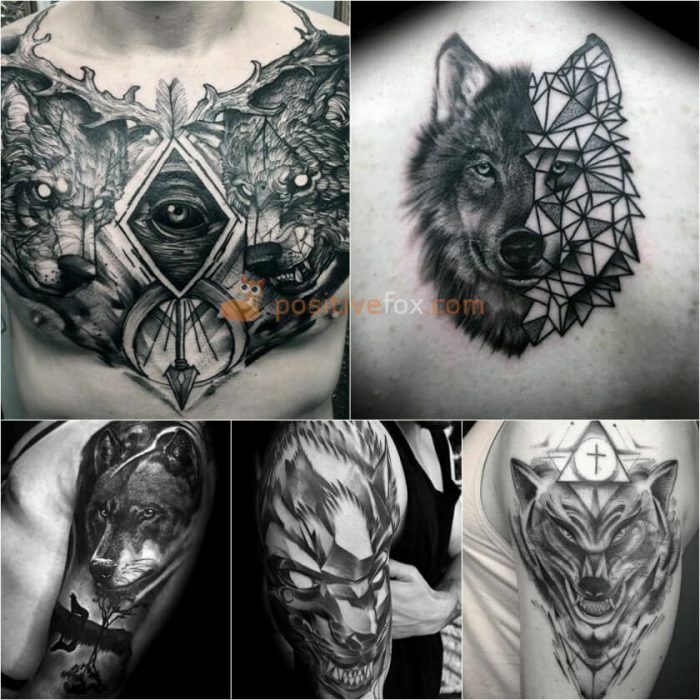 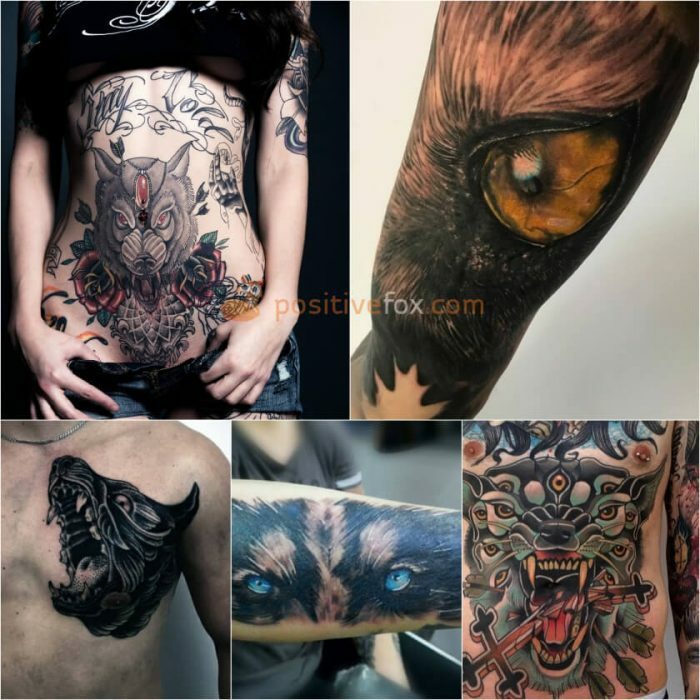 The popularity of wolf tattoos can be attributed to these qualities. 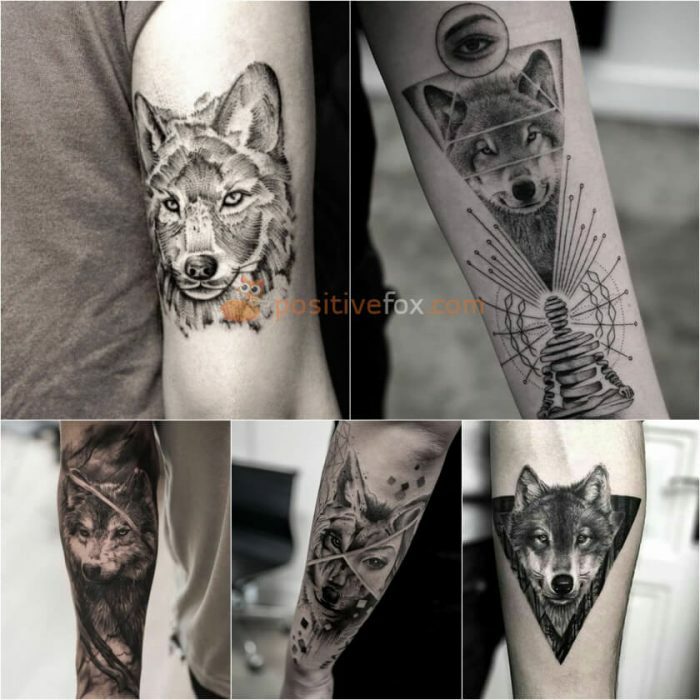 The wolf is a strong, intelligent and agile creature, which people have always treated with respect. 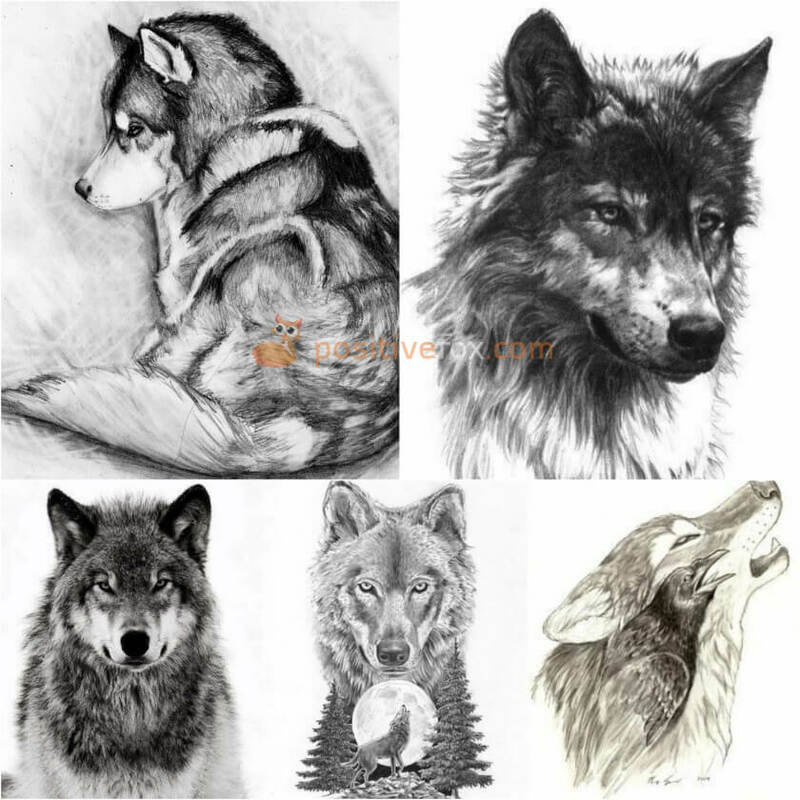 Loyal to both their pack and their mate, wolves are willing to face hardship head-on for the well-being of others. 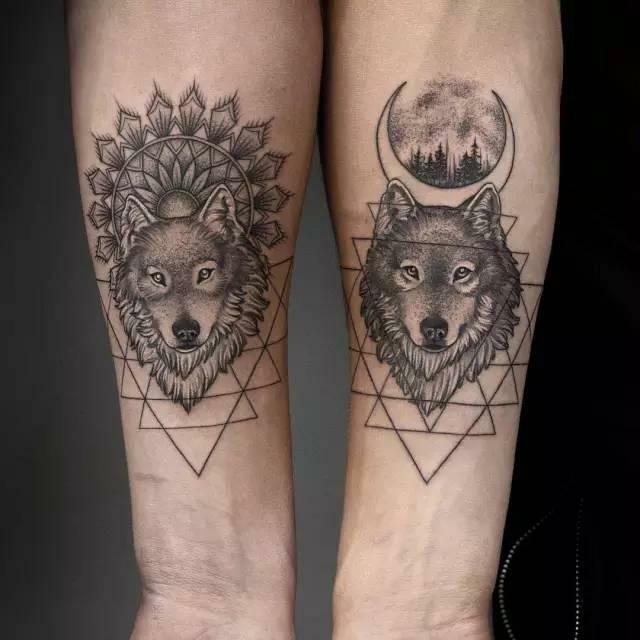 This makes a wolf tattoo an excellent choice for a person who shares the same values. 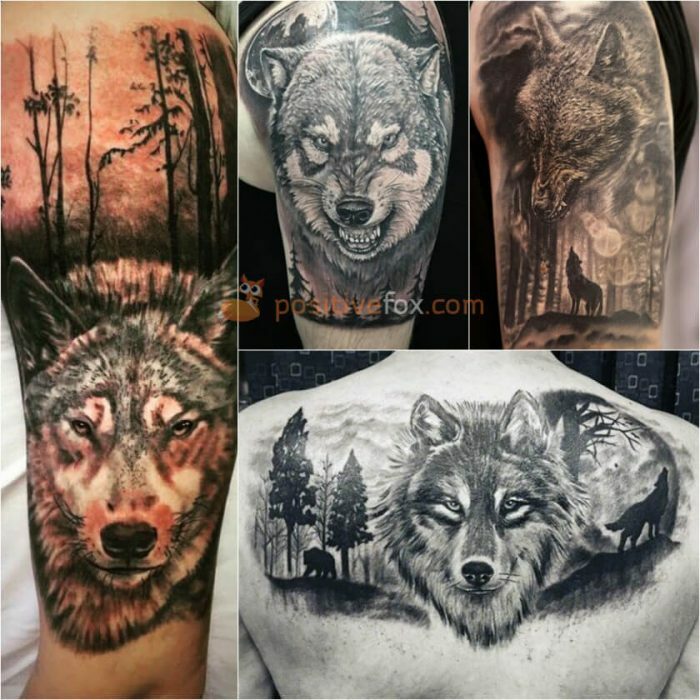 A wolf tattoo can have multiple meanings, and anyone who gets one should understand that it is not a good match for a weak, slow and indecisive person. 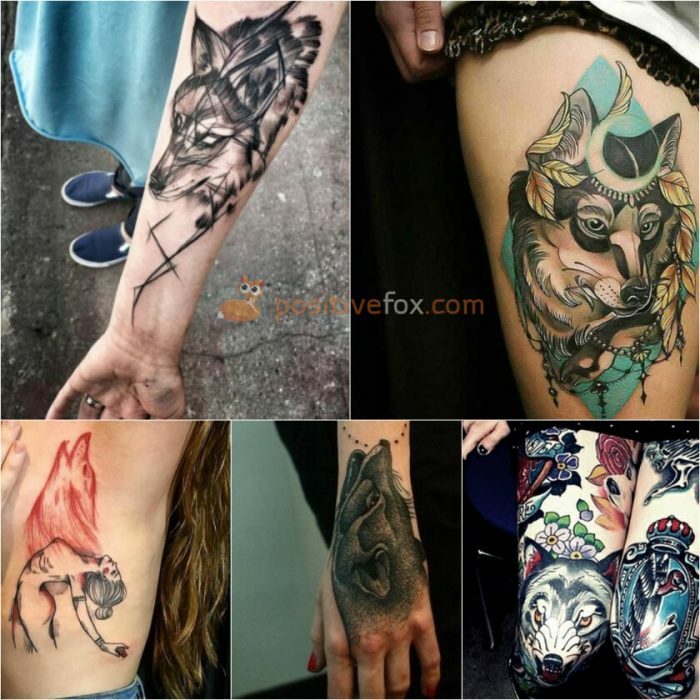 There are many variations of wolf tattoos and each one has its nuances. 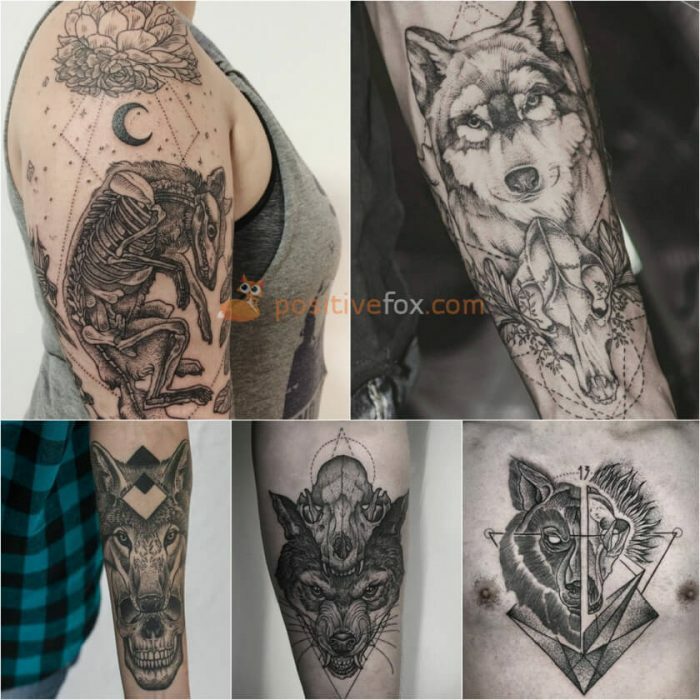 For example, a tattoo of a wolf howling at the moon is a symbol of loneliness or loss of a loved one. 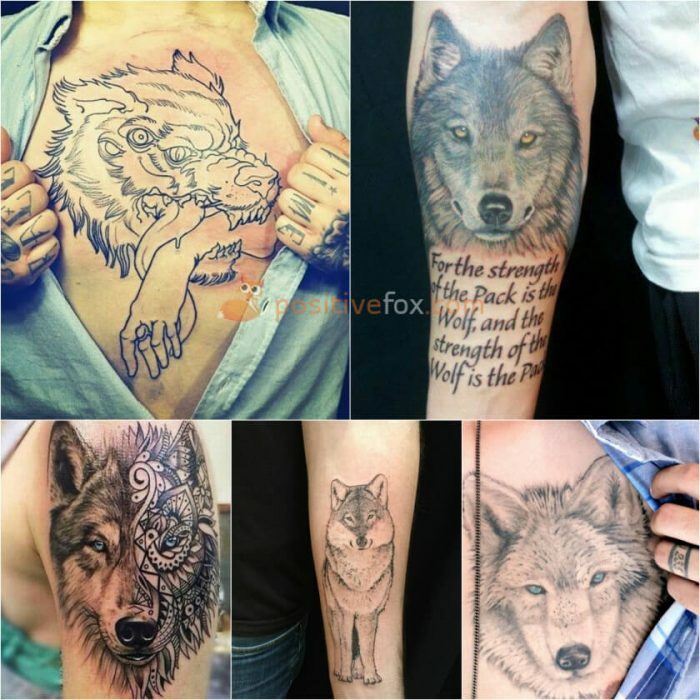 In some cases, a lone wolf can symbolize past betrayals. 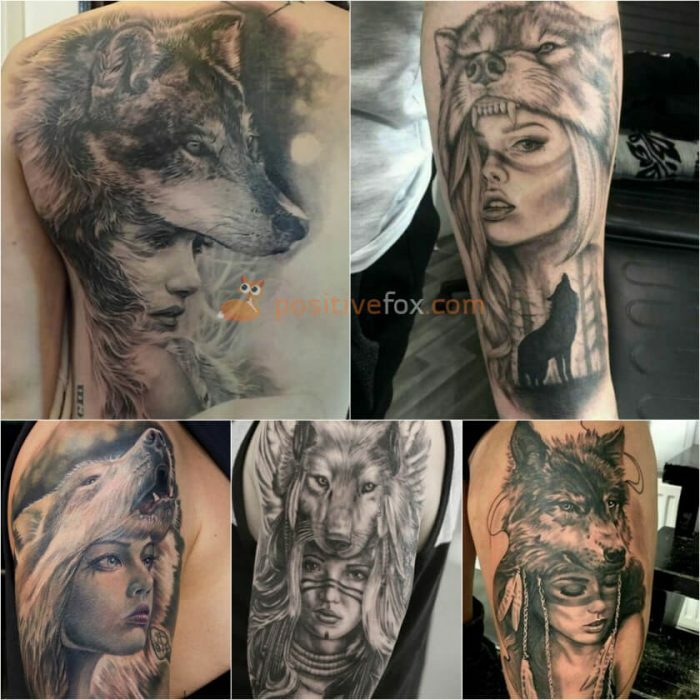 A white wolf tattoo hints at a unique personality. 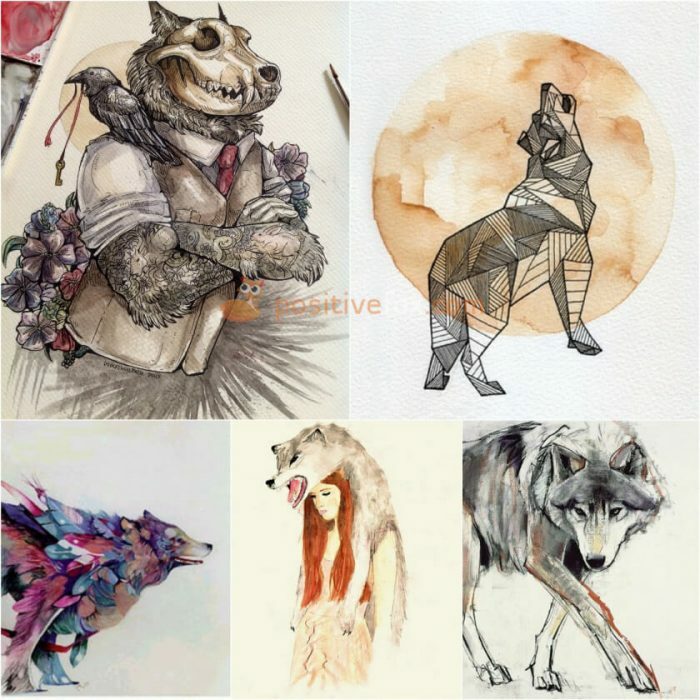 A fearless loner who easily adjusts to any situation. 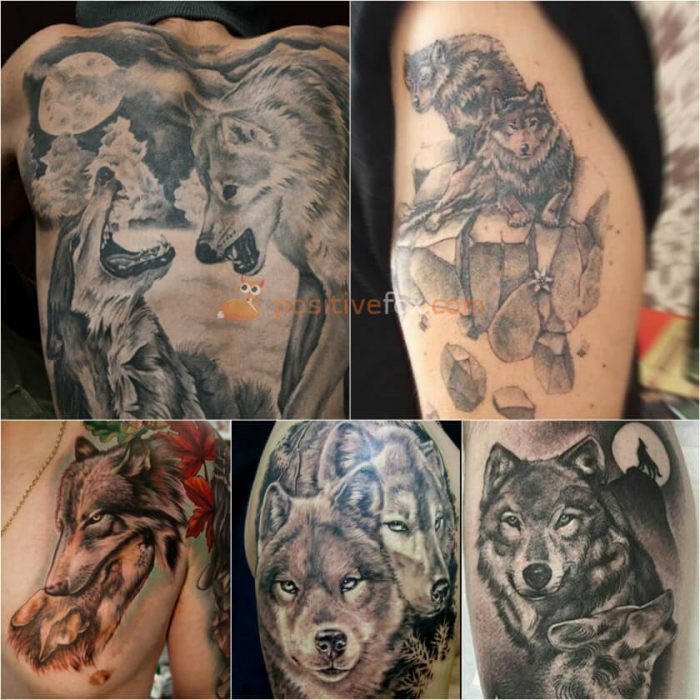 A two wolves tattoo may hint at a strong, loyal relationship or a birth of a family. 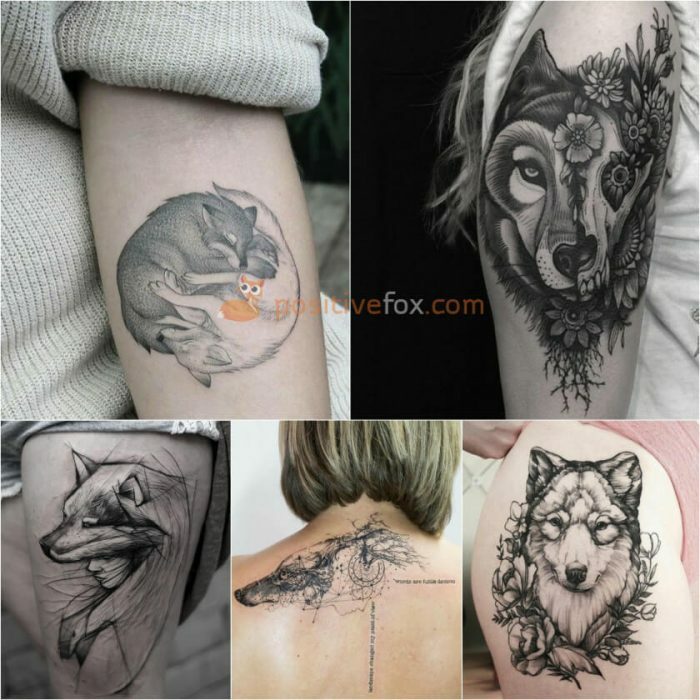 A wolf family tattoo may suggest that the person has strong ties to their family, and harbours a desire to help and protect those closest to them. 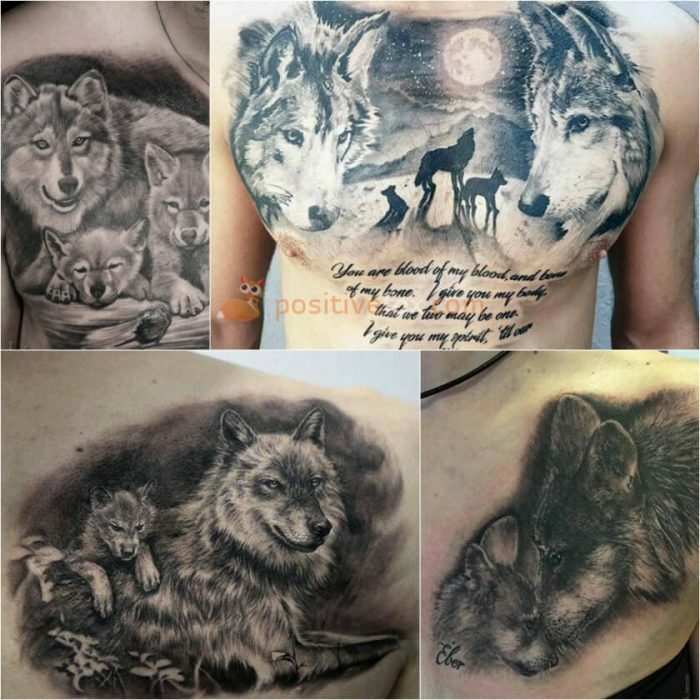 The wolf (especially when depicted alongside its cubs) is a symbol of loyalty, devotion, care and support. 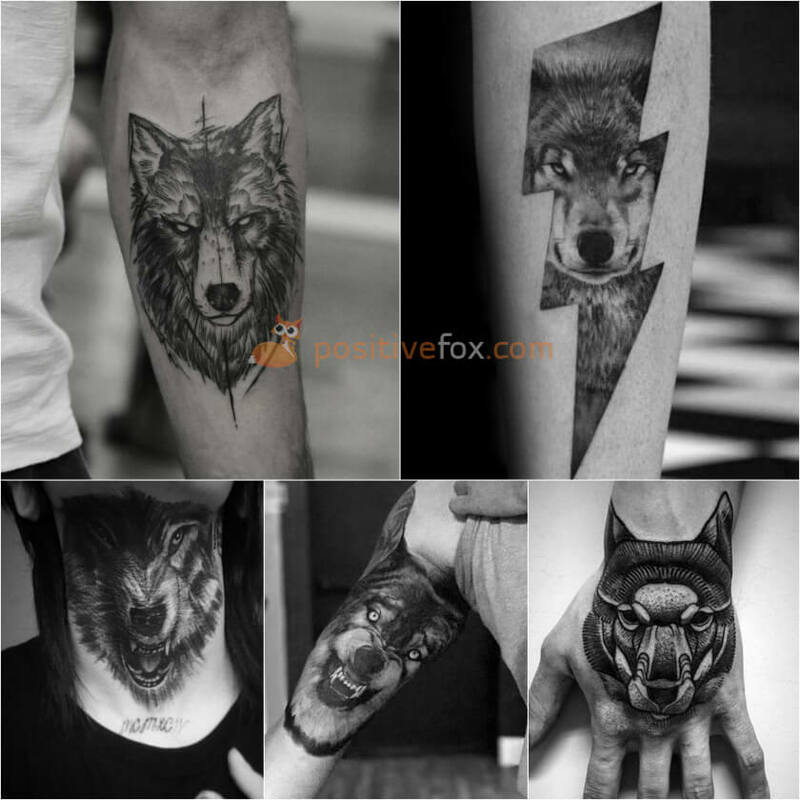 A snarling wolf tattoo symbolizes fearlessness, dominance, and a willingness to fight to defend their moral principles. 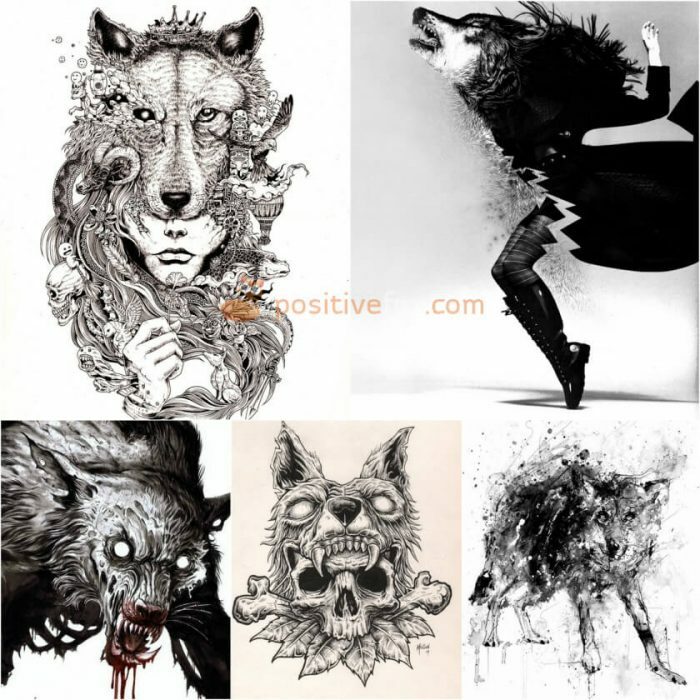 If the wolf’s mouth is slightly open, it may suggest that the person will attack first if confronted. 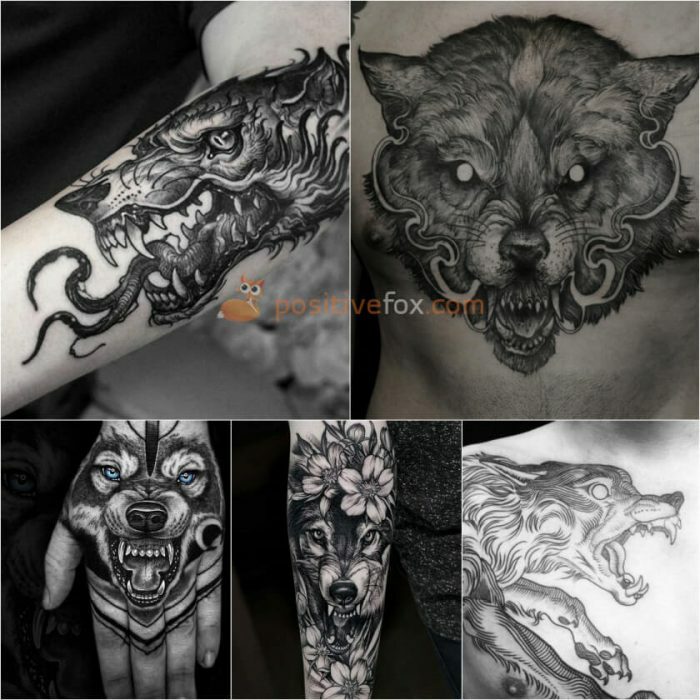 A tattoo which features a wolf with its mouth closed symbolizes a non-confrontational yet strong individual, who is willing to defend what is rightfully theirs. 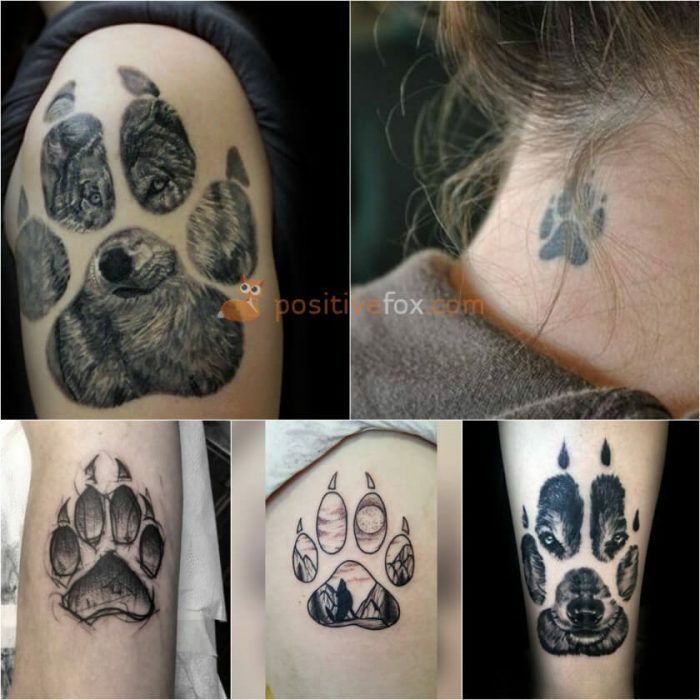 A wolf paw tattoo symbolizes the strength and steadfastness of the person wearing it. 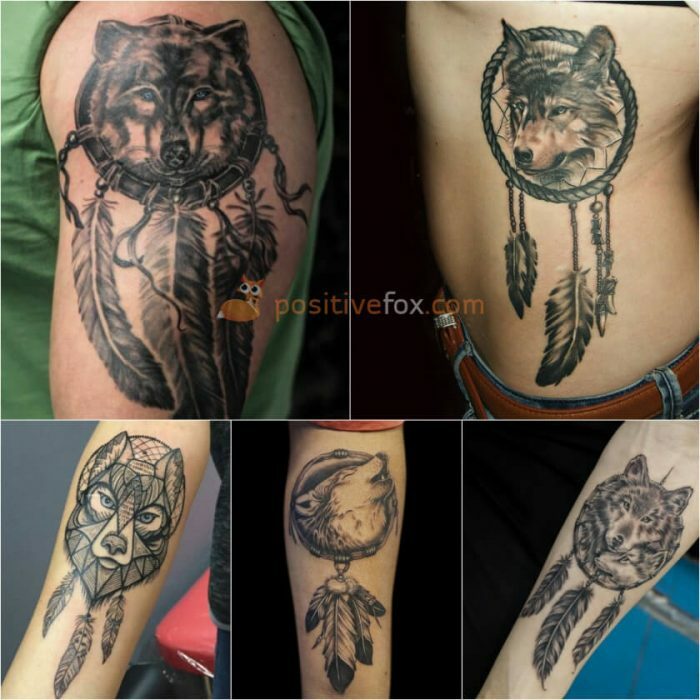 A wolf dreamcatcher tattoo is like an amulet that can ward off evil spirits and protect its owner while they sleep. 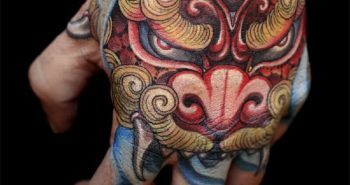 This tattoo also suggests that the wearer believes in the supernatural. 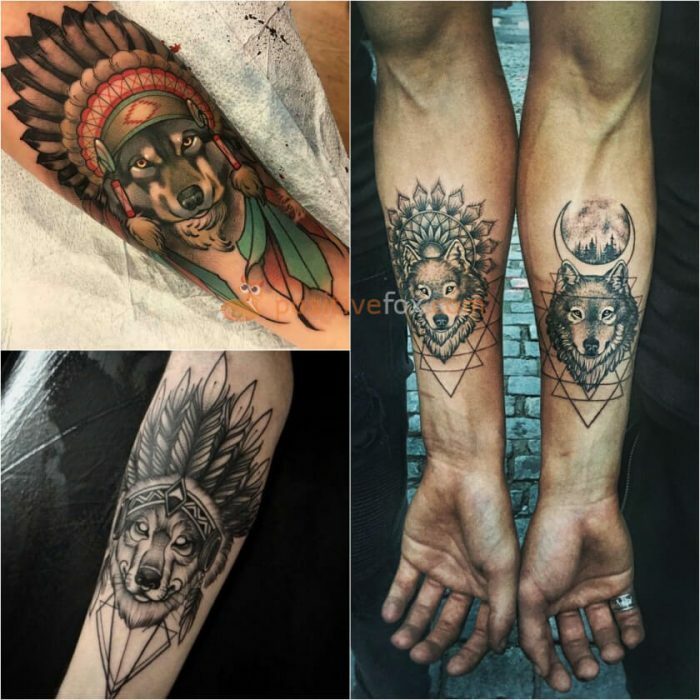 A wolf feather tattoo has a strong metaphysical meaning. 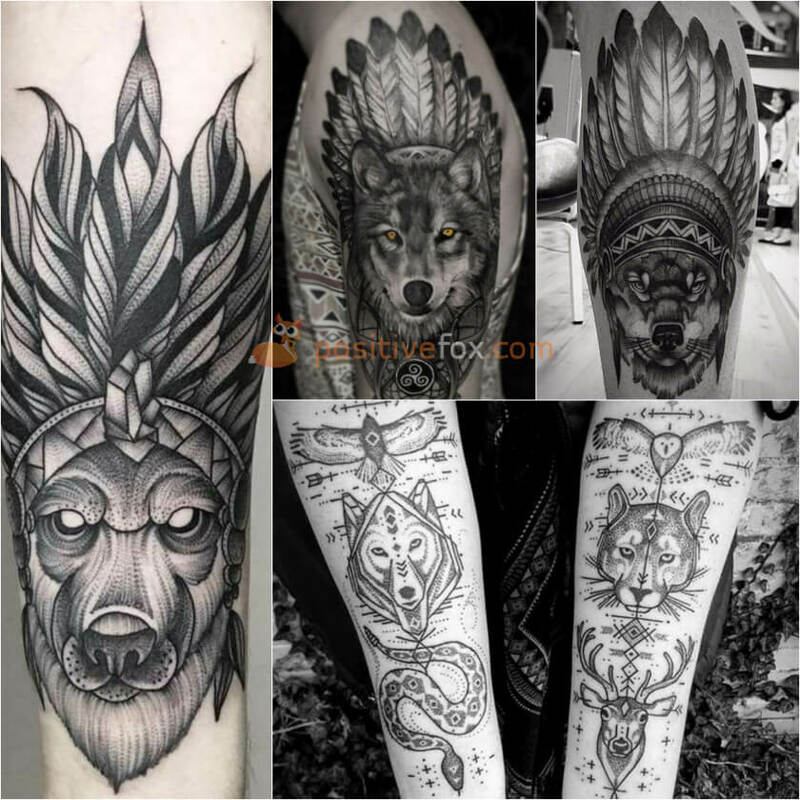 This tattoo reflects the wisdom, power, inner balance and strength of the wearer. 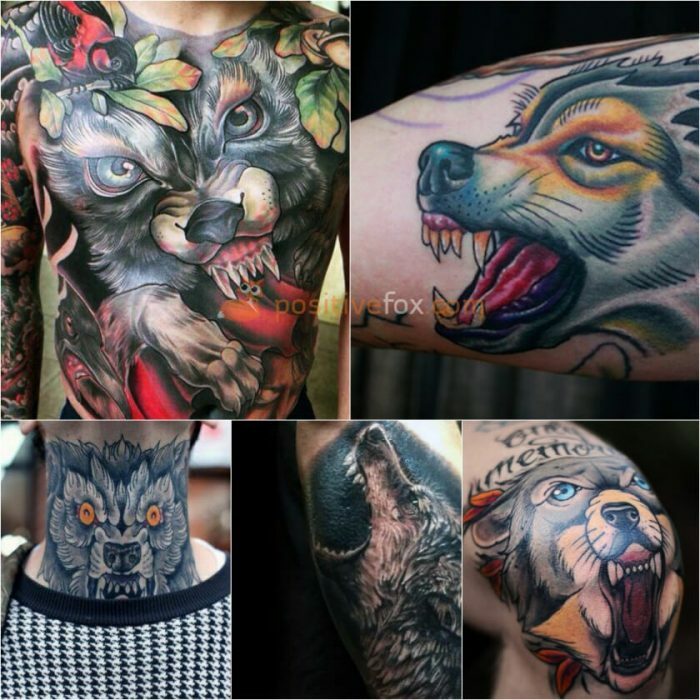 These tattoos typically portray a calm and fearless wolf’s face, which isn’t showing any signs of aggression. 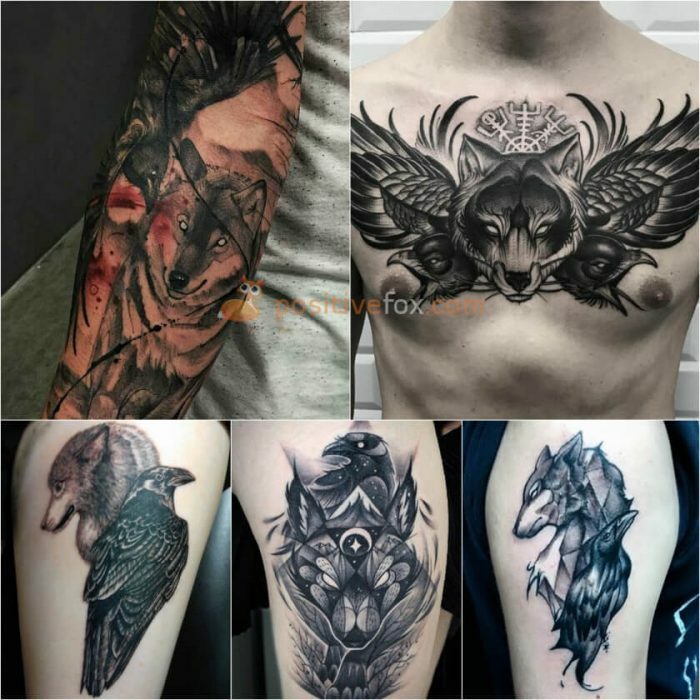 A wolf and crow tattoo epitomizes cunningness, wisdom, strategic thinking and the ability to keep secrets. 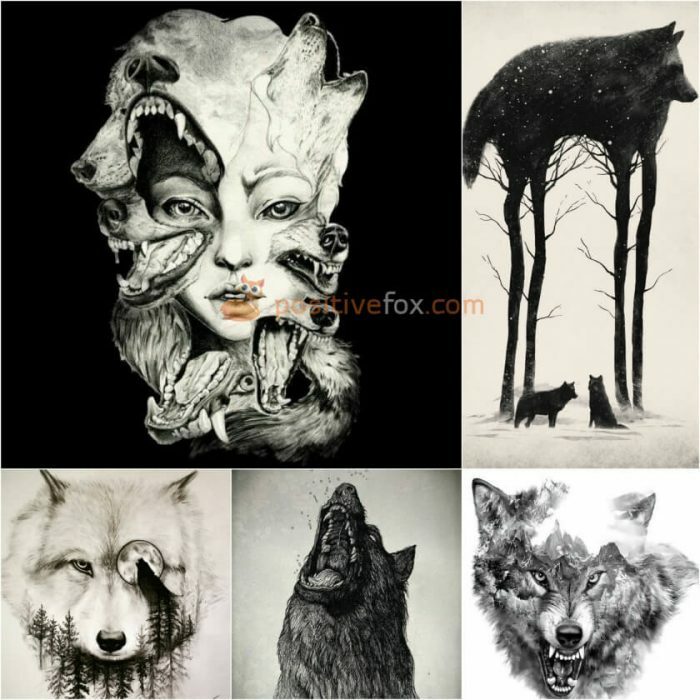 Both of these animals are recurring figures in Native American folklore. 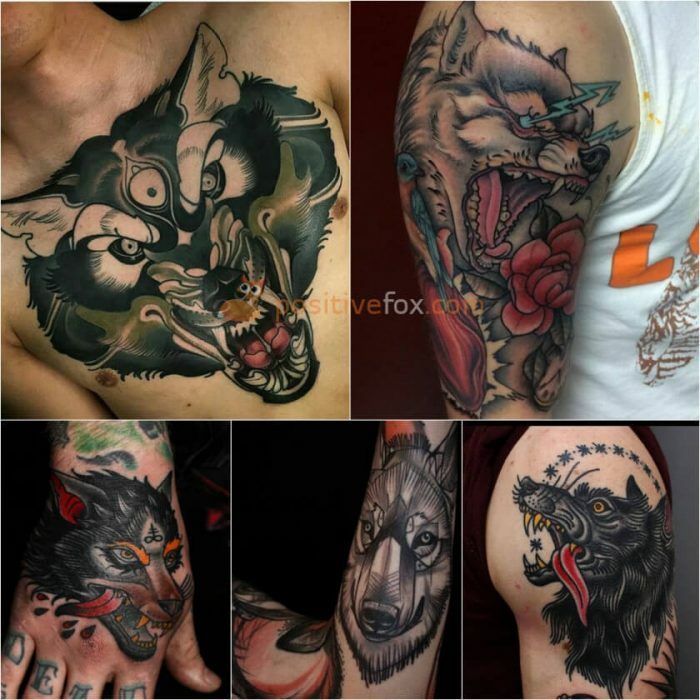 A wolf skull tattoo symbolizes the fragility of life – that it is not eternal. 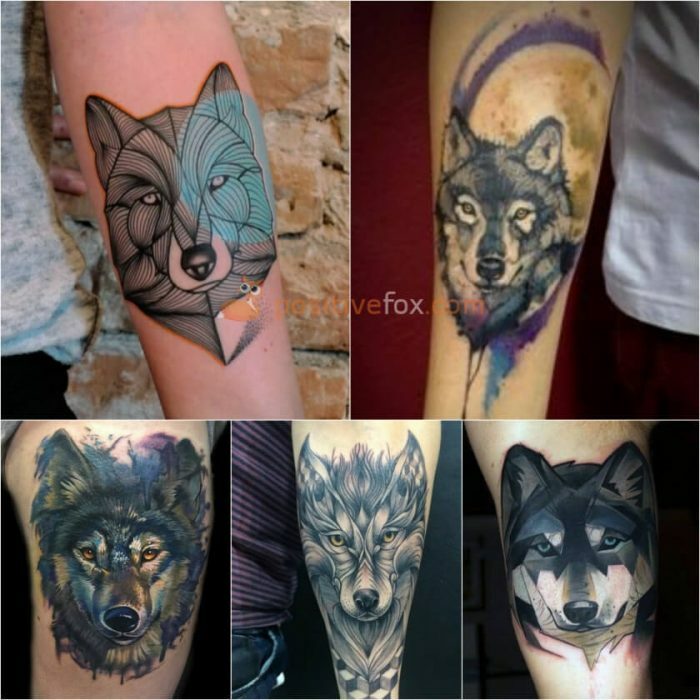 It means that the owner wishes to remain fearless in the face of death, just like a wolf. 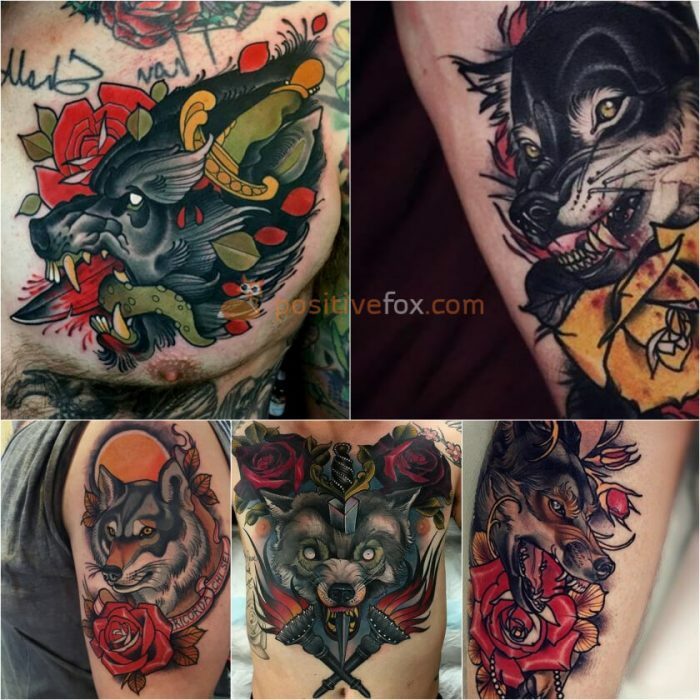 A wolf rose tattoo signifies the pure love the owner has for their partner. 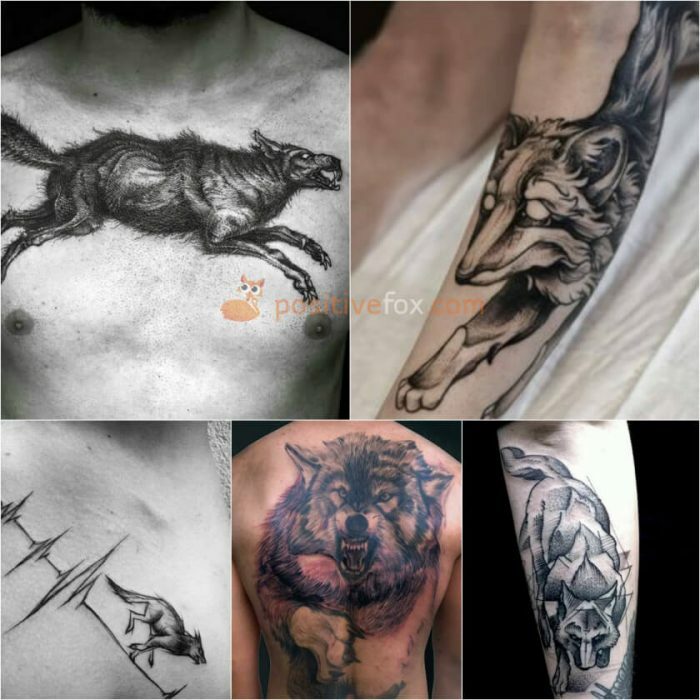 A jumping wolf tattoo hints at a readiness to intervene and overcome any obstacles. 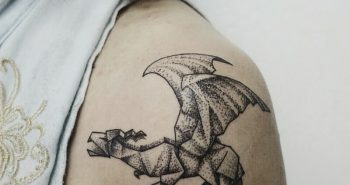 It represents a willingness to take risks, while also possessing the potential to take revenge should the situation arise. 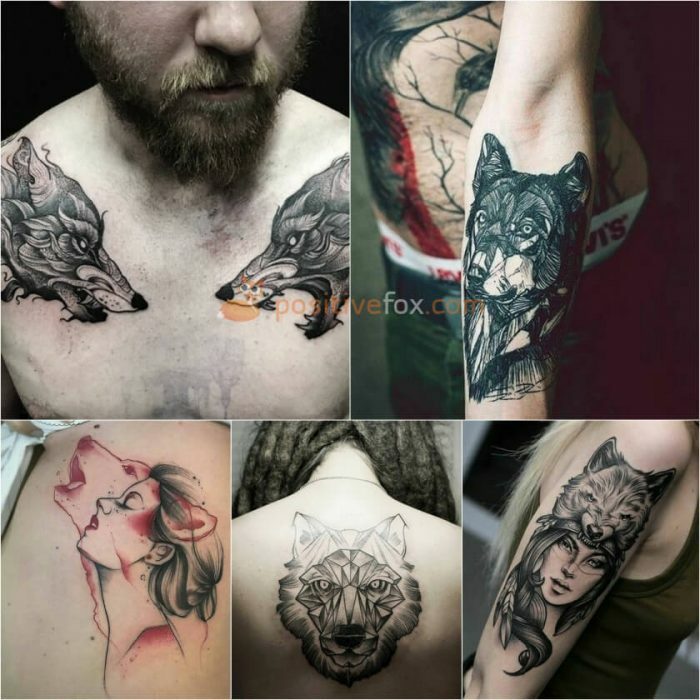 A tattoo of a woman with a wolf’s hide can be found on people who are mysterious and strong-spirited. 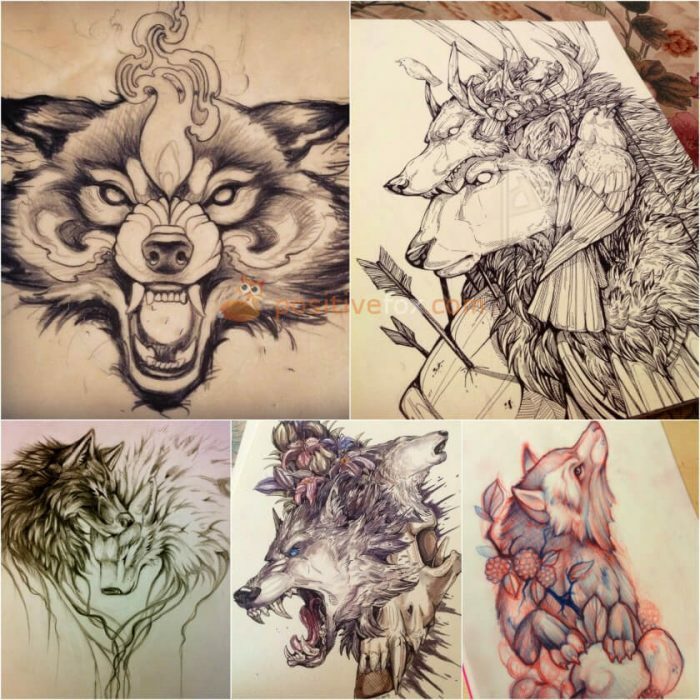 A wolf’s hide is spiritually symbolic. 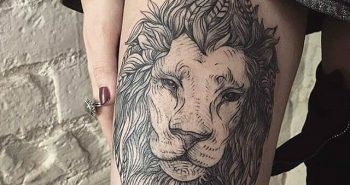 When a gentle, caring person wears the hide of this beast, they are endowed with its strength and power. 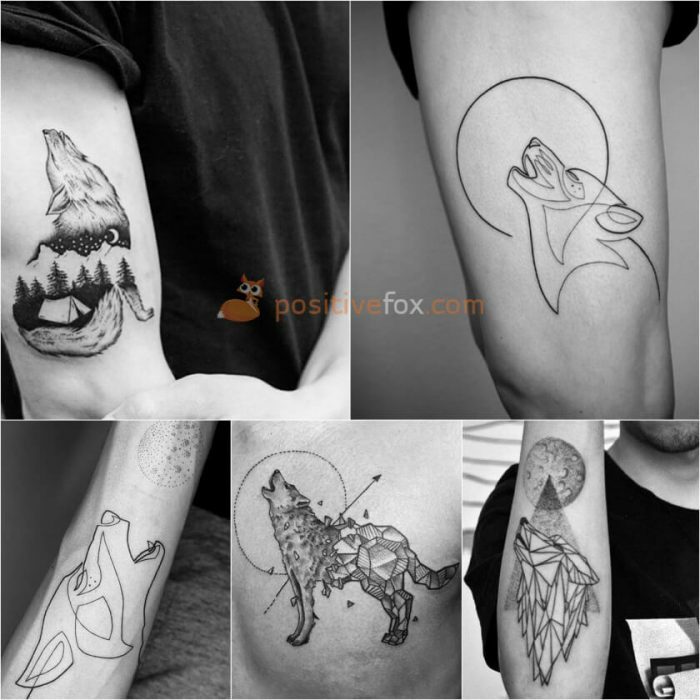 A wolf in the forest tattoo symbolizes maturity and an individual’s self-determination. 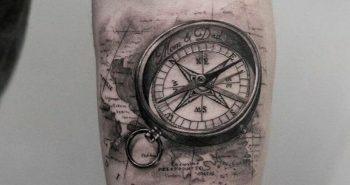 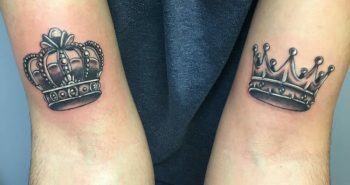 The person who gets this tattoo is a natural-born leader, who has their goals clearly laid out in front of them. 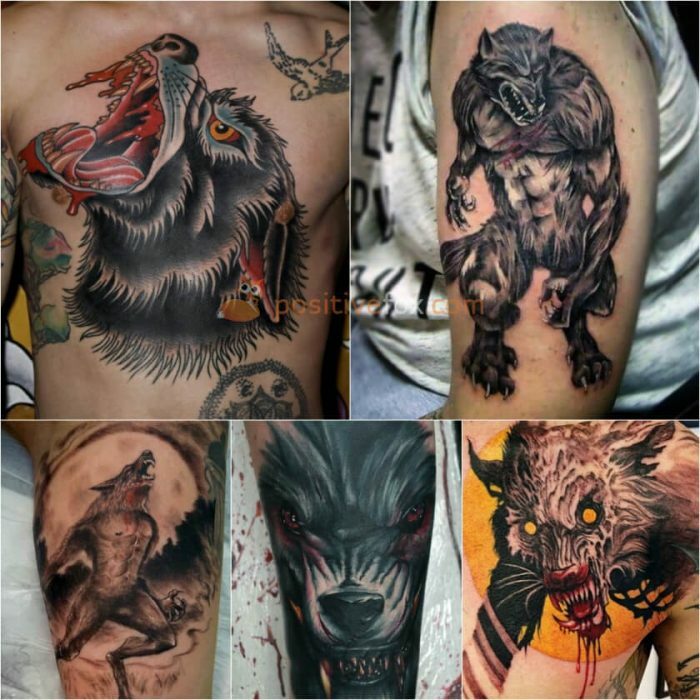 A werewolf tattoo, depicting partial or complete transformation, symbolizes the darker side of the owner, a side that they want to subdue. 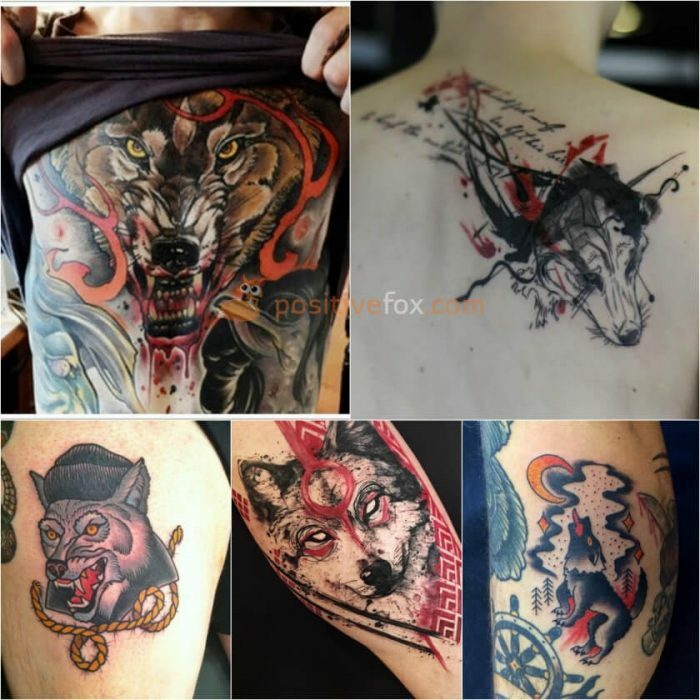 A tattoo of a wolf with red eyes or in flames is often found on those who identify with the forces of darkness. 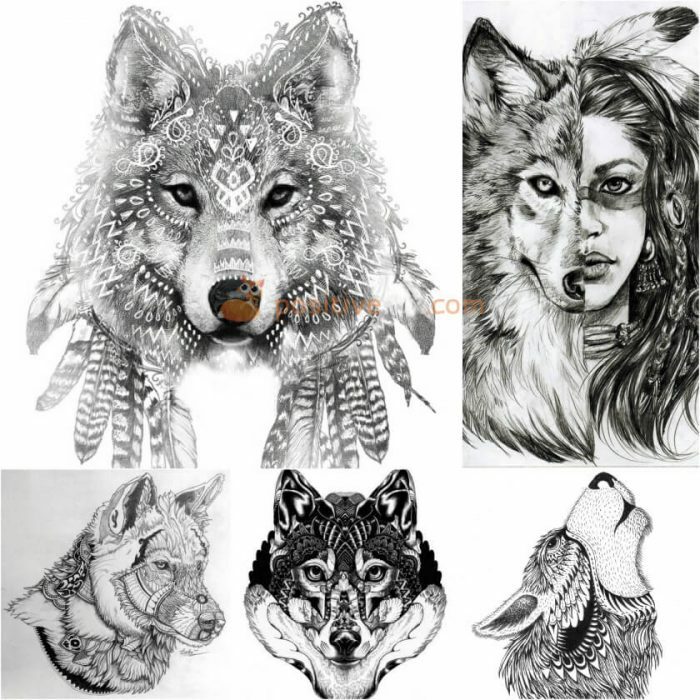 Ancient tribes believed that a wolf is not only a defender, but also an otherworldly guide. 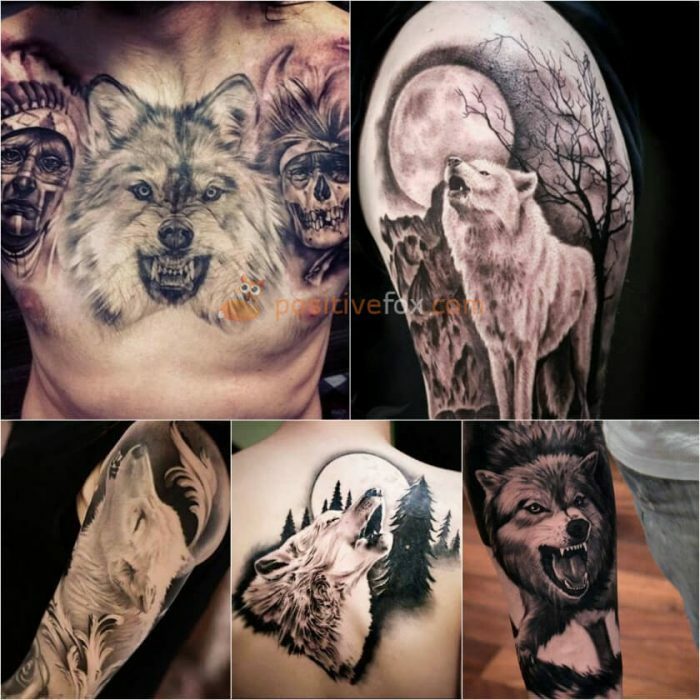 A man with a wolf tattoo is protective, courageous and instils trust. 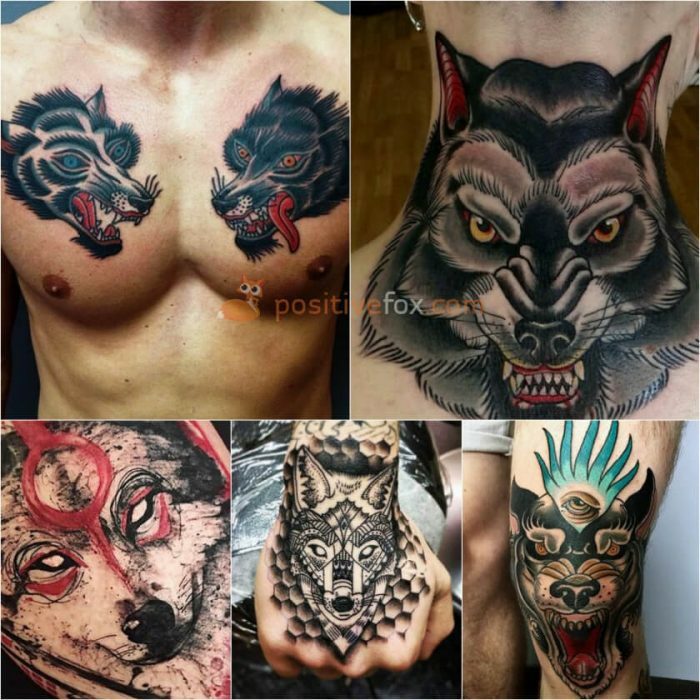 He is the leader of his pack. 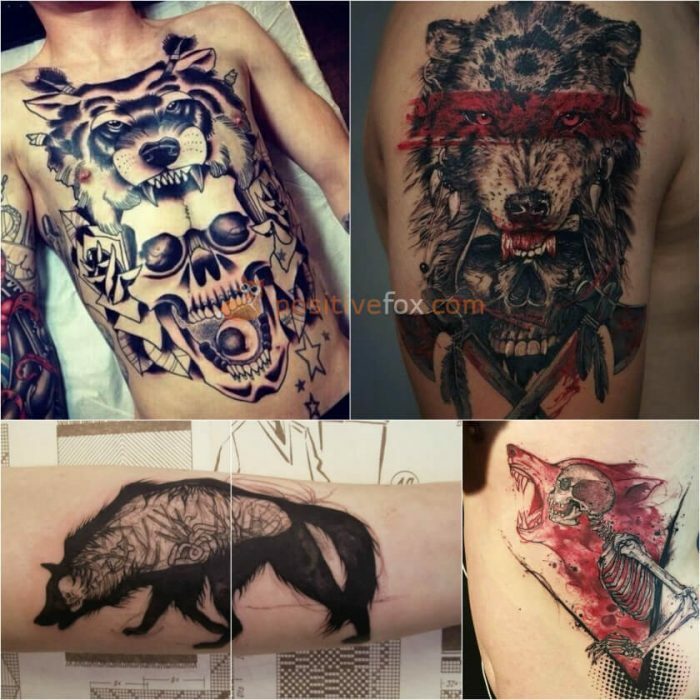 Wolf tattoos for men are executed to look as lifelike as possible, using one or several colours. 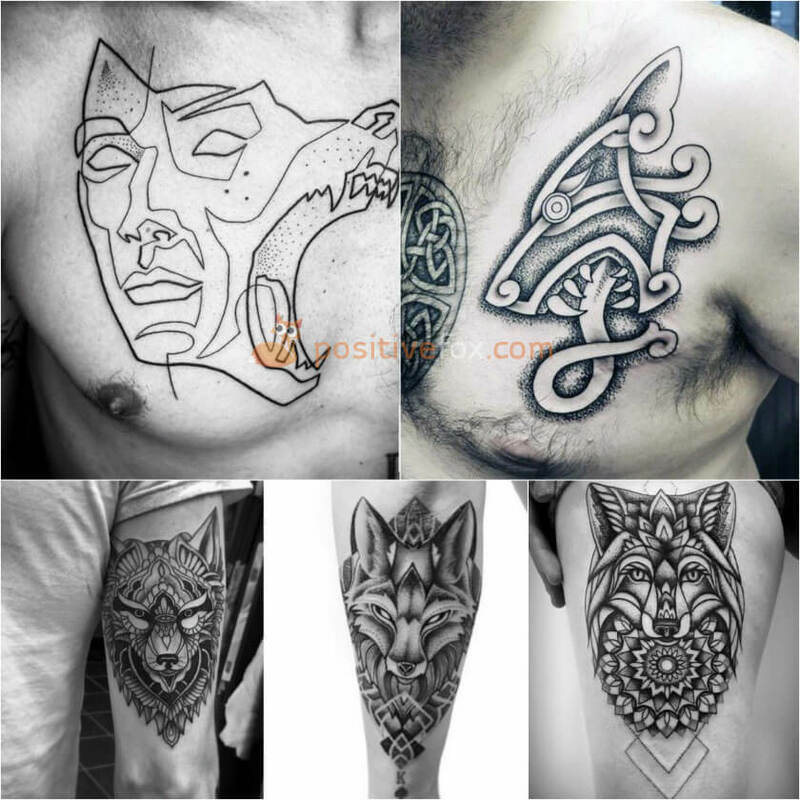 Men tend to emphasize the strongest aspects of this beast in their tattoo. 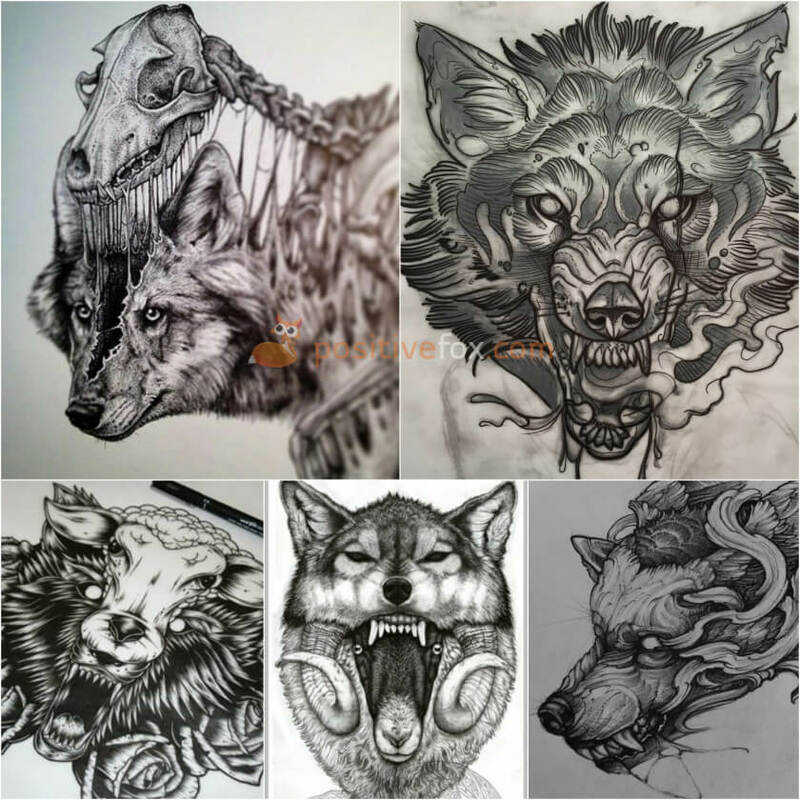 With the help of bright colours, shadows and highlights, to empathise most prominent features, the design becomes much more realistic. 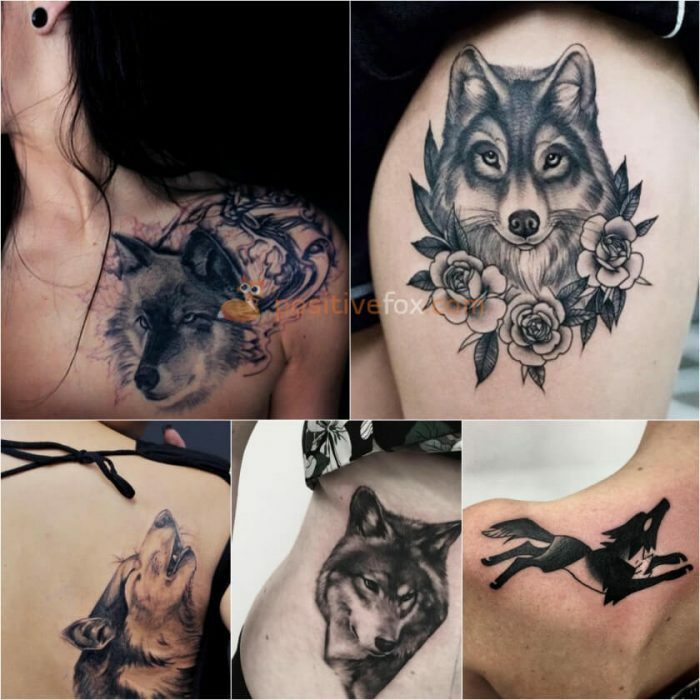 A wolf tattoo for women may be a symbol of loyalty towards her loved ones. 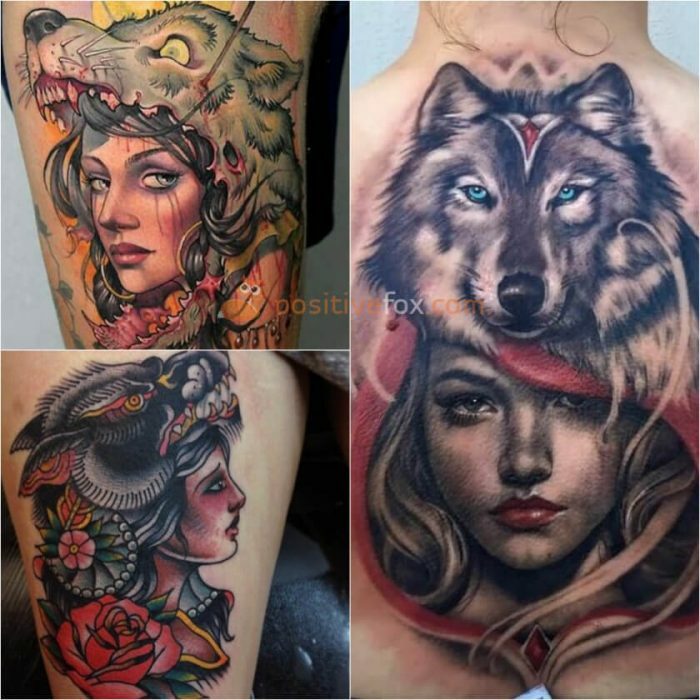 Women typically choose bright images and they often incorporate additional elements like flowers. 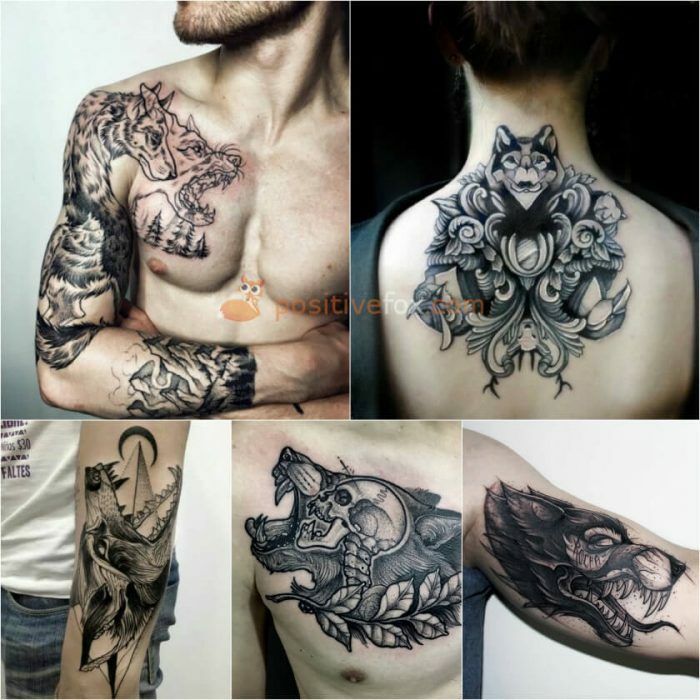 A wolf tattoo looks well on the forearms, chest, legs and shoulder blades. 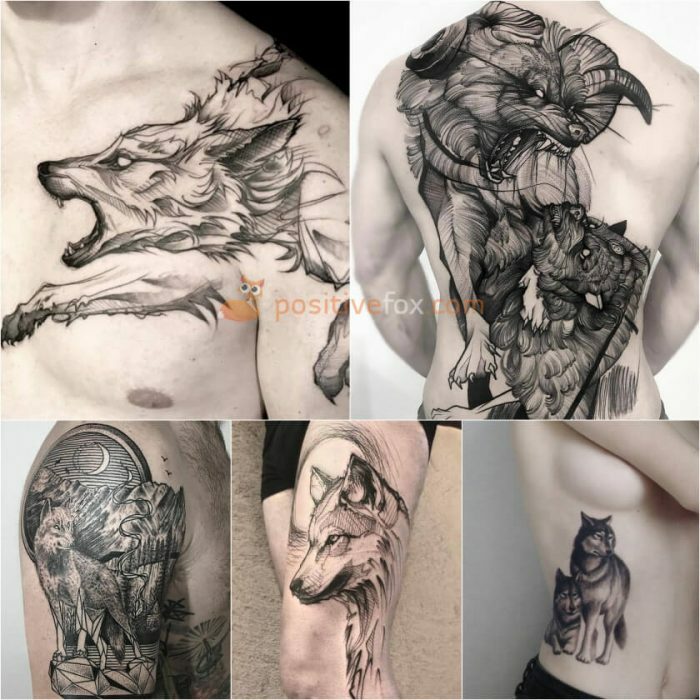 A symmetrical image of a wolf on someone’s back can also be a stunning tattoo choice. 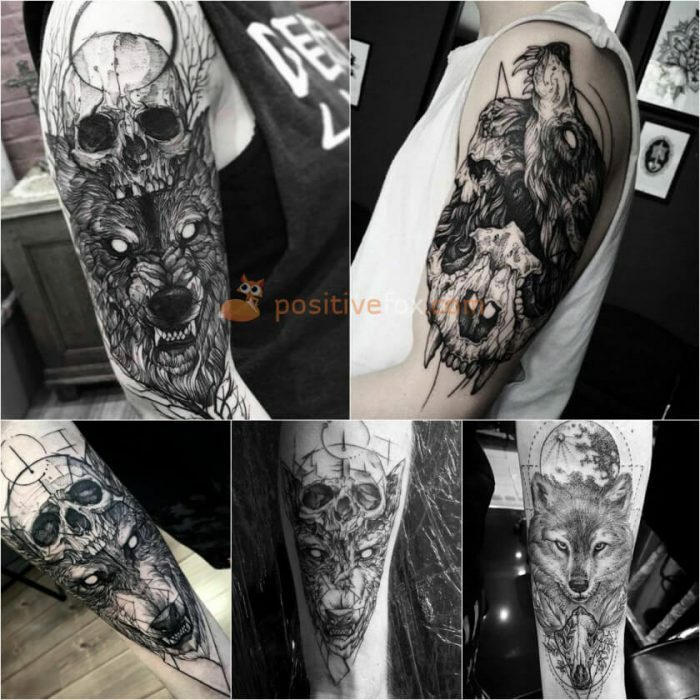 If you want your wolf tattoo to be visible and to remind you of the meaning behind it, a hand would be an ideal location for the design. 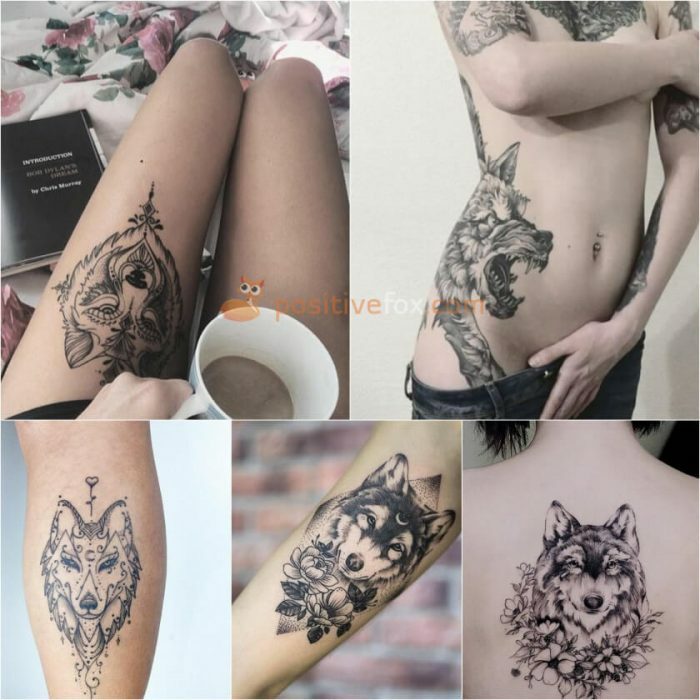 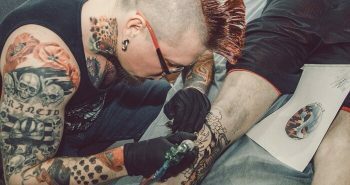 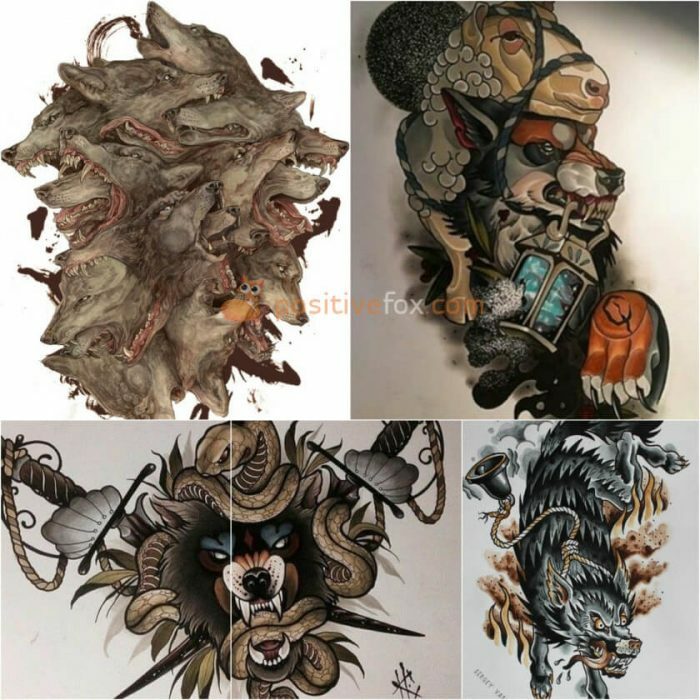 A wolf back tattoo will enable the artist to portray a vibrant story and include your values and beliefs by incorporating them into the smaller details and more intricate elements of the design.